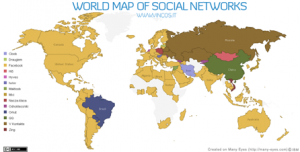 Social Networks: A Reflection of Cultural Differences? In his exploration of the history of the social web, Trebor Scholz remarks that the fundamental elements of what we call “social networks” today came from the Internet’s long emergence process, which began in the late 1960s. Although most authors agree that the first website that displayed all the characteristics of a social network site (SNS) was the site Sixdegrees.com, which was launched in the U.S. in 1997. What began as a relatively confidential service aimed at avant-garde American Internet users became, in the space of thirteen years, one of the main uses for the modern Internet. This was primarily due to the success of Facebook. Far from being limited to the States and Europe, social networks have progressively conquered hundreds of millions of Internet users all over the world. This essay will try to give a panorama of social networks across the globe, illustrating the principal trends that currently characterise this sector. browse these contact lists, as well as their contacts and those of others as well. The nature of these links and what you are able to do with them within a system varies from one social network to another. According to this definition, social networks combine at least three main functions: as a support of a virtual identity, as a vehicle for sociality based on shared characteristics or interests, and as a networked media for interpersonal and/or intergroup communication. The first function mentioned allows the expression of what Dominique Cardon calls the “process of self-simulation” (2008), that is to say “the tension between those traits that characterise a person within their real life (daily, professional, social) and those that create a projection or a simulation of oneself, virtual in the original meaning of the word, which allows them to express a potential version of themselves”. The second function signifies that any uses being developed for social networks are pre-determined by the pre-existing socio-cultural characteristics of those who use them. For example, as Danah Boyd illustrated (2007), the choice that young people make between Facebook and MySpace is largely influenced by their ethnicity and class.